Now that the recycled products of Americans are no longer desirable, perhaps it will start a new broader conversation: when will Americans consume less? The whole American lifestyle revolves around consumption and includes innumerable objects that are difficult to reuse or refuse. Much of it seems to come under the ideologies of efficiency, cheapness, and convenience. Envision Walmart. It is not just about small items or particular companies; it even makes its way to some of the largest purchases Americans make including buying larger homes to store more stuff. What would it take to start the ball rolling away from consumption of goods? A small set of Americans have voluntarily done this – I recall reading about downshifters in sociologist Juliet Schor’s twenty year old book The Overspent American. A major company like Amazon or Walmart could make a big dent. Or, perhaps some government regulations might help nudge the free market in the right direction. There is a slight chance a movement of conscious consumers could help lead to change. And if consumption levels do end up dropping, this could effect all sorts of areas in American social life. What would happen to fast food? The smartphone industry? Housing? Carmakers? Food producers and distributors? Watching it all play out could be fascinating. I argued a few days ago that the American system is set up to encourage people to purchase bigger homes. Look, the system is working! 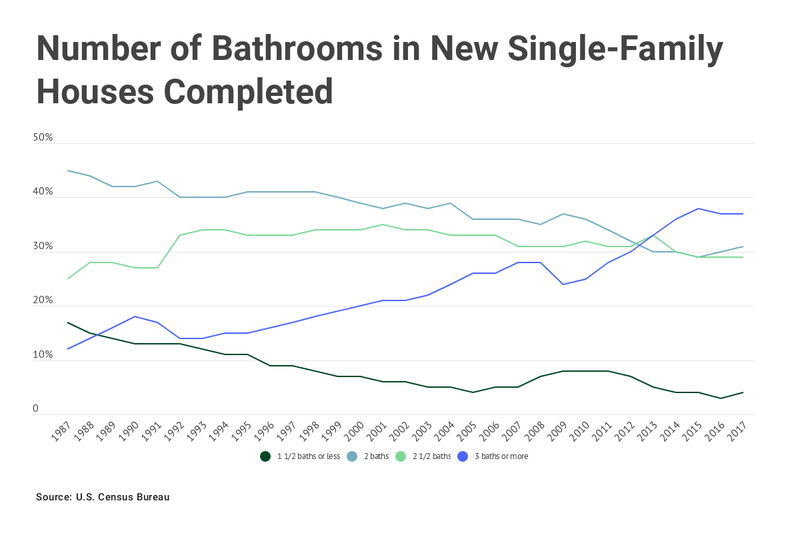 Americans continue to build and buy bigger homes. Below are some takeaways from the Survey of Construction data released in June. Based on the most common features, the most popular home built in 2017 was a two-story, two-garage home with more than four bedrooms and three bathrooms. Even with plenty of critics, American builders and buyers still seem to want larger homes. 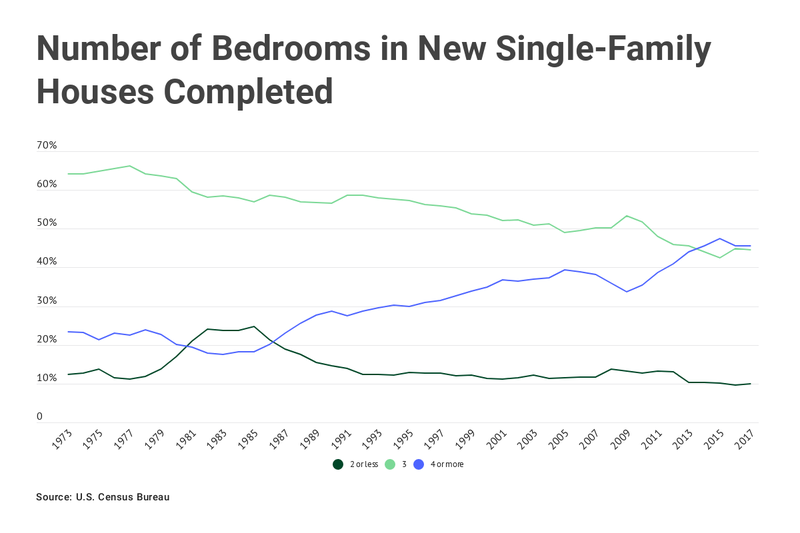 Perhaps the market is primarily open these days to wealthier buyers and builders may not be interested in constructing starter homes but this is not an isolated blip in the data: for decades, Americans have sought larger homes. The connections between SUVs and McMansions continue: this article features a list of traits of Cadillac Escalade owners and their favored kind of housing. That people of different class statuses purchase different brands and models is well-established, going back to the General Motors brand for every buyer as well as more academic studies showing different tastes among different social classes. What I would want to see in this case involves something more: where is the data that shows McMansion owners favor Escalades over Navigators? Or, that people who own Escalades are more likely to live in McMansions than other kinds of homes? There are those who are drawn to the Escalade simply because it is so far over the top. You see them pulling up to McMansions in the suburbs and to hip-hop clubs downtown, making a statement before the truck comes to a halt. On the flip side, it is not hard to find people who are appalled, sometimes with fanatical fervor, by what the Escalade represents. Glaring from subcompacts or crosswalks, they seem to hold this hulk of metal responsible for global warming and dolphins in tuna nets. The Mark LT is priced thousands below its prime competitor, the Cadillac Escalade EXT, but the equipment list shows why. The Caddy has 45 more horsepower and comes only with full-time four-wheel drive. (Lincoln’s system is part time, and costs extra.) Lincoln doesn’t offer a navigation system, air-conditioned seats, traction assist, stability control or power folding mirrors. Its power seats have manual recliners. In April 2012, they selected a model costing about $850,000 from a luxury builder and chose a number of standard options for an additional $650,000. Ms. Sleep, who was in the process of selling the software firm she founded nearly two decades earlier, added a wall of windows to the basement and furnished it with a pool table, a media room, a wet bar, a home office and a suite for their youngest daughter to use when she was home from college. They added a second master bedroom suite, on the ground level, for use when they are older and stairs become tougher to climb. They upgraded floors, carpeting and molding, added a sunroom and a large deck and supersized the garage door to fit Ms. Sleep’s Cadillac Escalade. The home’s lighting and temperature, as well as media on any of 14 televisions and the sound system, can be controlled remotely. I get that it takes a certain amount of wealth to own either an Escalade or McMansion – and linking McMansions to wealthy people is common – but I have yet to see more evidence that McMansion owners prefer Escalades. Generationally speaking, the stereotype of millennials as urbanites falls flat when it comes to homeownership. The Zillow 2016 Consumer Housing Trends Report found that 47 percent of millennial homeowners live in the suburbs, with 33 percent settling in an urban setting and 20 percent opting for a rural area. Erich Merkle, an economist with Ford, says that as millennials cross the threshold into family life, they’re buying large SUVs. “We expect them to carry on as they age with three-row SUVs and likely go larger simply because they need the space to accommodate children that are now teenagers or preteenagers,” he said. That combination so emblematic of 2000s consumption – the suburban big home (a McMansion?) and SUV – may be back. On one hand, perhaps this is what millennials are used to or they think they should aspire to. On the other side, consuming these objects can draw criticism. Did Americans learn anything (housing bubble, reliance on cheap oil)? Do they understand the consequences of these purchases (a commitment to sprawl and consuming more than they need)? How could they make such uncool choices (compared to dwellings in hot urban neighborhoods or acquiring cooler vehicles)? The Asian hyper-dense urban mall is also making an appearance in American cities. Miami has Brickell City Centre, a five-story mall in the heart of the city. Covering three city blocks, it’s topped by three high-rises (and was built by a Hong Kong developer). New York City is building a seven-story mall attached to two skyscrapers in Hudson Yards, America’s largest private development. The Santiago Calatrava-designed Oculus—the centerpiece of the World Trade Center—has a mall with over 100 stores, with its white-ribbed atrium attracting an army of tourists taking pictures with selfie-sticks. Since the hub connects office buildings with train and subway stations, the stores are also “irrigated” by the 50,000 commuters who pass by each weekday. I’d love to see an analysis of how sales change when people are intentionally funneled through consumption spaces like this.